ACCES was profiled in the October 2012 edition of TechNation with circulation of ~25,000. This profile article provides a good overview of our organization. TechNation is a US publication dedicated to Biomedical Engineering. It is a informative Biomed Publication with both a hardcopy and an online version of the magazine available. Click here to see the Article on the techNation website. 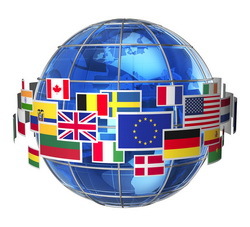 This year in addition to encouraging ACCES members in Atlantic Canada to attend our Webinars via the Learn and Win Program we are making an increased effort to attract those from outside Atlantic Canada. As our promotional mailings indicate; ACCES Webinars are free to anyone, anywhere evolved in the Biomedical and Clinical Engineering profession. I was very please when I saw a Ian Bowen register with a New Zealand Email domain. Thinking this would make a great article for our website I contacted Ian and discovered he was indeed located in New Zealand. Ian was kind enough to tell me about the work he does and even provided a few pictures of himself and co-workers. 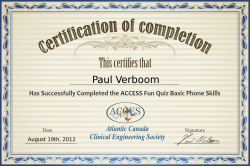 Starting in fall 2012 ACCES is offering our members certificates for our Webinars. These certificates can be put toward your continuing education requirements,or framed and hung if you desire. To obtain a certificate you must successfully complete a short quiz on one of our Webinars. After each new Webinar we will be posting a Quiz on that Webinar and a link to the quiz will be given during the Webinar. Health Technology Management, a new moniker for Biomedical and Clinical Engineering departments. Admittedly, when I first ran across this acronym my thoughts where, “Great just what this field needs, another name”. If not being able to decide if we where Biomedical Departments or Clinical Engineering Departments wasn’t bad enough lets start calling our field something altogether different. After attended a recent AAMI sponsored webinar HTM Leadership. I had to rethink the whole subject. The CCNB (Community College New Brunswick) Bathurst is now offering a Biomedical Technology training program. This is in addition to the French only program they offer.